Glinda: Have you read Cathy Maxwell's new book, LYON'S BRIDE? Dorothy: Yes! A Scottish witch cast a curse on the Chattan family. Glinda: Oh, my, what was the curse? 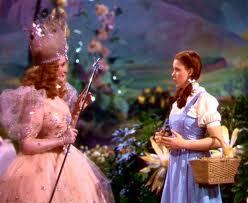 Dorothy: "When a Chattan male falls in love, strike his heart with fire from Above." Glinda: How can the family defeat the curse? Dorothy: The three siblings are trying to live without love. Yet the eldest, Lord Lyon, desires children. His solicitor suggests he use the match making services of the widowed Mrs. Martin. Unknown to Lord Lyon, Mrs. Martin is his childhood friend who he forsake because of the curse. Glinda: Should we send them the ruby slippers? Dorothy: Lord Lyon just needs to remember There's no power like love. Glinda: (dabbling tears from her eyes), who is this storyteller? Dorothy: From Cathy's website (at this link), "I was raised in Olathe, KS. I am a Kansan by nature–stubborn, loyal, independent. I now consider Virginia my home and think I have adapted well to the Southern way of life (although I’ll never be a good cook!)" Glinda: Tell me more about Cathy! Dorothy: She also wrote on her website, "I’ve spent six years in the Navy. I worked in the Pentagon and did a tour with Naval Intelligence. I’ve also managed a watch factory, been a news broadcaster, and done costumes for local theater. Tinker, tailor, soldier, spy." Glinda: I think there must be some of Cathy Maxwell in Lord Lyon to face this curse! Dorothy: I know there is some of Cathy Maxwell in Mrs. Martin as she gives Lord Lyon the reason to face this curse. In fact, Lyon could borrow a quote from my friend the Lion, "I would never have found my courage if it hadn't been for you." Glinda: Where can we learn more about LYON'S BRIDE? Barnes & Noble at this link. Glinda: What's next in the series? Dorothy: Referring back to Cathy's website, "The second book of the series is THE SCOTTISH WITCH. Look for it in November ’12. The third book of the trilogy, THE DEVIL’S HEART (I love that title) will be out in early 2013. I think these books are some of my best. I can’t wait for you to read them." Lion: (roar) Kim posted her five star review of LYON'S BRIDE on Goodreads at this link. 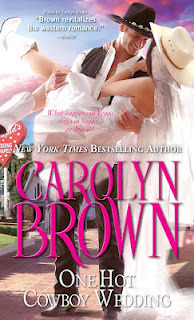 Tinman: (squeak) Kim is giving away a print copy of LYON'S BRIDE. Just leave a comment about your favorite quote for success. Scarecrow: (rustle) This giveaway is open to all readers. Comments are open through Saturday, April 28, 10 pm in Hawaii. Kim will post the winner on Sunday, April 29. 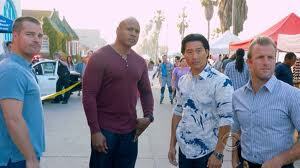 Aloha to H50 and NCIS:LA in crossover episode! Joint Base Pearl Harbor Hickam (JBPHH). scenes on March 26 at this link. On Tuesday night, Danno and Chin visit LA. I have no idea what is the plot ... but does it matter? LL Cool J in my backyard is enough! When you watch the episodes, look for the "tan houses with brown roofs" in the background. That's my neighborhood! Are you a fan of H50? NCIS? Crossover shows? Guest stars? Cliff hangers? One randomly selected commenter wins a book choice from my convention stash. This giveaway is open to all readers. Comments are open through Saturday, April 28, 10 pm in Hawaii. I'll publish the winner on Sunday, April 29. April's month long giveaway is CLEAN OUT MY CONVENTION STASH. 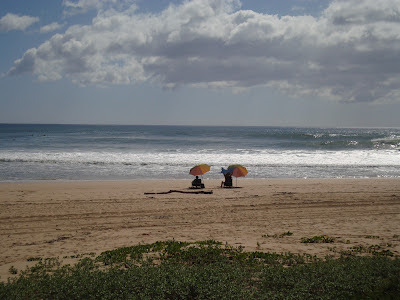 I will select one US reader, one Canadian reader, and one International reader from all my blogs posts in April at SOS ALOHA, THE READING REVIEWER, and ALOHA ON MY MIND. The US winner can select up to 10 books (to fill up a small flat rate box) from my current convention stash to make room for new books coming from RT 2012. The Canadian and International readers can select one book, too! CLEAN OUT MY CONVENTION STASH is open through Monday, April 30, 10 pm in Hawaii. I'll post the winner on Tuesday, May 1.
by Amanda McIntyre and Bobbi Smith. ... with friends of all types! We also have winners at SOS Aloha! - Sheree is the winner! - CBails wins the Las Vegas gift pack! Barbara, Tina(purple), and Flchen1 win a book choice from my convention stash. Winners - please confirm your prize by sending your mailing address to sos.aloha@yahoo.com. We return to book reviews and author interviews this coming week! Bobbi Smith remembers Judi McCoy! Aprils' month long giveaway is CLEAN OUT MY CONVENTION STASH. I will select one US reader, one Canadian reader, and one International reader from all my blogs posts in April at SOS ALOHA, THE READING REVIEWER, and ALOHA ON MY MIND. The US winner can select up to 10 books (to fill up a small flat rate box) from my current convention stash to make room for new books coming from RT 2012. The Canadian and International readers can select one book, too! By Saturday, most readers and writers are exhausted ... yet the biggest events are just around the corner! The Giant Book Fair offered every genre. Cait Miller is a Scottish author and sweet lassie! her new book, LYON'S BRIDE, next week. Delilah Marvelle offered chocolate in a bottle! Kathryn Falk joked with cover model CJ! This author was so cute! Cherry Adair always lights up the room! Tammy Falkner and Ava Stone. Navy sister Kieran Kramer share a smile. served as the Color Guard. Medley, and God Bless the USA. Today is open comments in honor of the US military and its allies. Their continued efforts preserve our free speech. One randomly selected commenter wins a book choice from my convention stash. This giveaway is open to all readers. Comments are open through Saturday, April 28, 10 pm in Hawaii. I'll post the winner on Sunday, April 29. I finally met Dani from the RT Boards! April's month long promotion is CLEAN OUT MY CONVENTION STASH. I will select one US reader, one Canadian reader, and one International reader from all my blogs posts in April at SOS ALOHA, THE READING REVIEWER, and ALOHA ON MY MIND. The US winner can select up to 10 books (to fill up a small flat rate box) from my current convention stash to make room for new books coming from RT 2012. The Canadian and International readers can select one book, too! 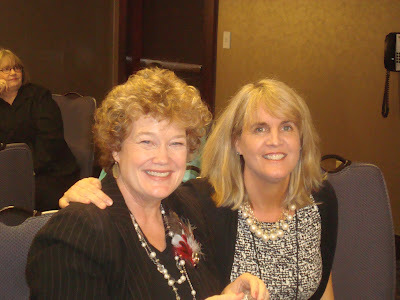 Kathryn Falk chatted with Charlaine Harris! Ruthie Knox promoted RIDE WITH ME. I suggested she wear biking shorts and helmet! A personal favorite - Marliss Melton! A recommended read from Elf - Kendall Gray's INHALE. Kendall will be my guest in May. Here's Shona Husk and Tim Tams! they delivered her a kitled hero (and haggis maker). .... and Sara Humphries with a fellow blonde! Friday night spotlighted Chicago's rich history. NIGHT OF THE STARS - "All the Jazz" meets "Chicago". in July. I expect to see them again at SOS Aloha! What's your favorite Broadway musical - ALL THAT JAZZ? CHICAGO? PHANTOM OF THE OPERA? One randomly selected commenter wins a book choice from my convention stash. This giveaway is open to all readers. Comments are open through Saturday, April 21, 10 pm in Hawaii. I'll post the winners on Sunday, April 22.
the Dancing Queen for SOS America!